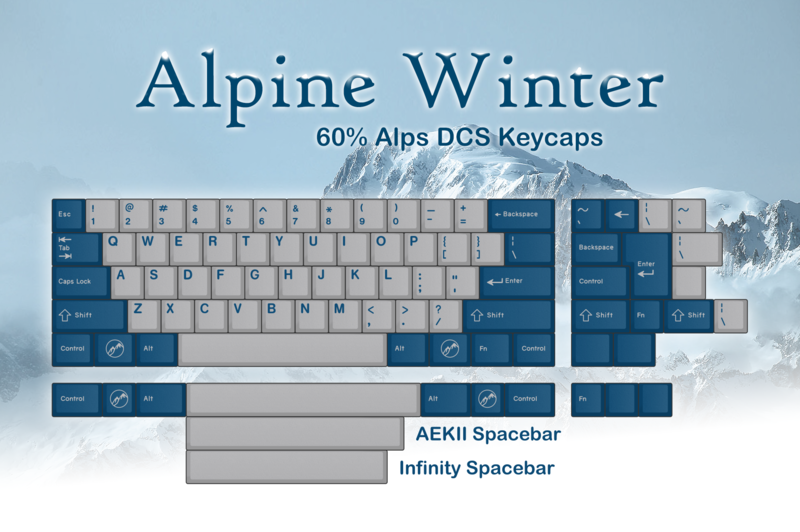 Alpine Winter is a keyset for 60% Alps boards which provides broader 60% compatibility than any MX keyset to date. 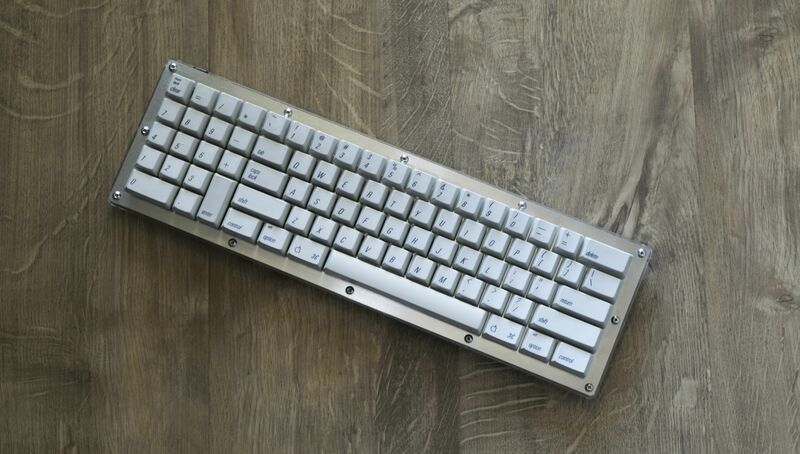 This elegant keyset is designed to look classy on any Alps 60% keyboard. You can use it by itself or mix and match with Badwrench's BX teal modifier sets. 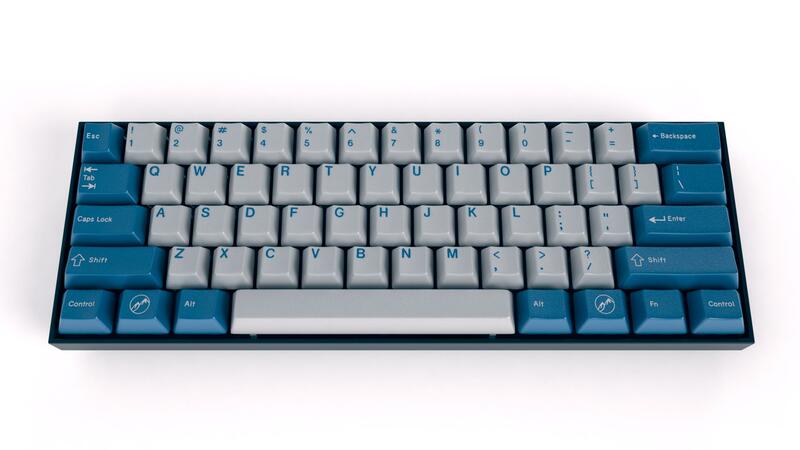 Either way, your board will look great and you'll be a part of something special: the first community-produced full 60% Alps keyset. 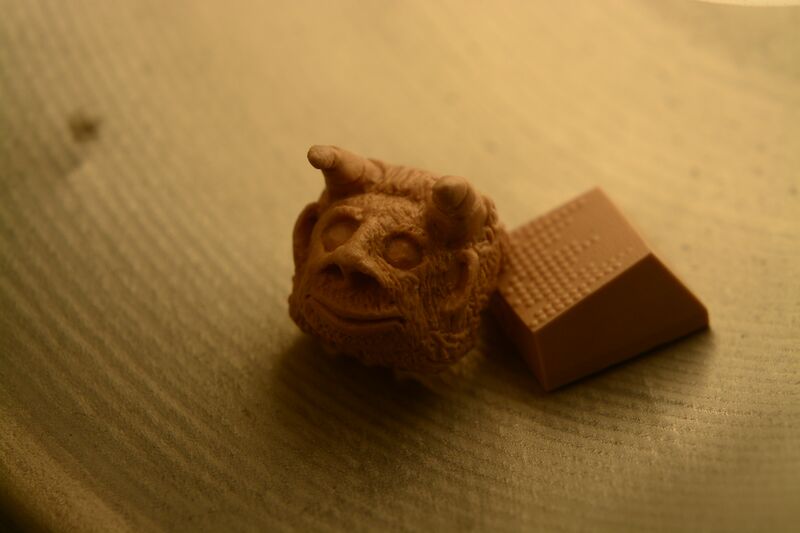 No keycap artisan on Geekhack loves Alps more than our pal nubbinator. So to help encourage people to join this buy early, nubs is offering 5 doubleshot Alpine Winter-themed Dolly V2/Fn sets as giveaways! Rules: These sets will be raffled off between the first 50 orders at the 50 MOQ. So if you order 2 sets at the 50 mark, that's 2 entries in the raffle! If you order one set at the 50 mark and one set at the 75 mark, you get one entry in the raffle. And if you order 100 sets at the 100 mark, you get no entries in the raffle. Remember, you'll pay the lowest possible price based on total orders, even if you commit at the 50 MOQ, so join right away! When signing up for the buy, you will have the chance to commit to the pricing tier(s) of your choice. Shipping still TBD. CONUS orders will most likely ship via USPS. International orders, I will do my best to determine the best shipping method ASAP. Infinity Hacker Spacebar (6U) 2-Pack. One gray and one blue. AEK II Spacebar (6.5U) 2-Pack. One gray and one blue. 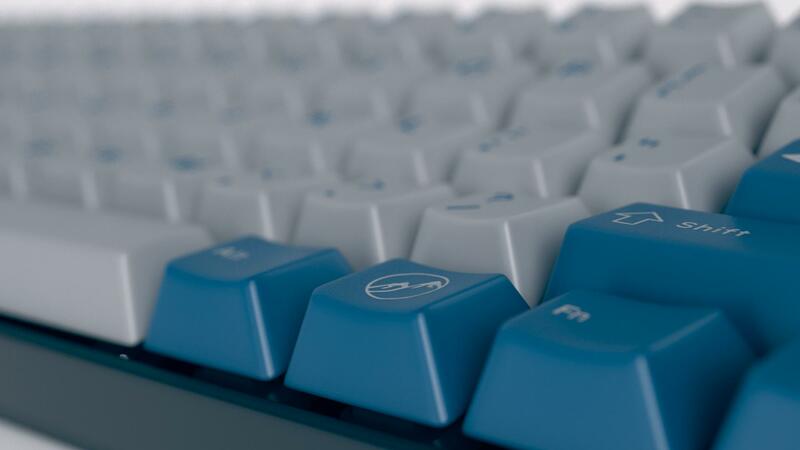 Standard Blue Spacebar 2-Pack. One 6.2U and one 7U. Novelties and blanks are available a la carte, even if you don't purchase a base kit. Personalize your Alps board and show your love for Geekhack with the Geekhack Novelty Pack! This pack includes 2 GEEK HACK keys and 2 Sadsters. Have you heard about Monarch? 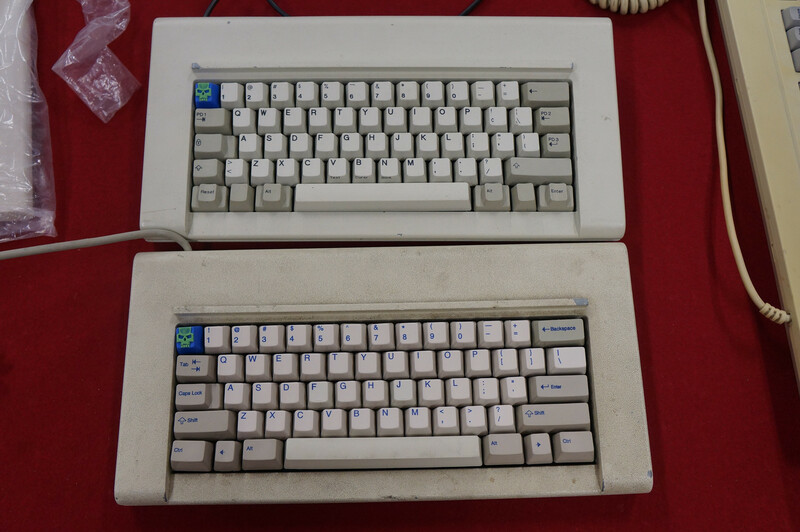 The Monarch is an custom Alps 60% + LHTK (left-hand tenkey) based on the AEKII layout. The Monarch group buy opened up shortly after Alpine Winter, and I've been wishing there was a way that Alpine Winter could support the numpad cluster since day one. Well I'm thrilled to announce that we are now offering a special numpad blanks kit, exclusively for Monarch buyers! 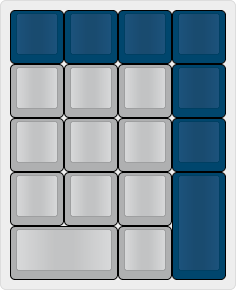 The Monarch kit includes a full set of blanks for an AEKII numpad layout, and the cost is $16/set. Because this is an exclusive for Monarch buyers, ordering and delivery will be handled through koalapear. Contact him with any questions. NOTE: This numpad kit was made possible by an anonymous benefactor, and is strictly exclusive to Monarch buyers. I will only be shipping these kits to koalapear, who will handle fulfillment. Do not contact me asking me for a numpad kit, you will be ignored. Do not contact me asking me for any 1x2 vertical keys, you will be ignored. Thanks. Invoicing will be done via PayPal after the buy is closed. Once all funds have been collected, I will submit the order to Signature Plastics. Current lead time for DCS sets is about 6 weeks. The buy will close Saturday, October 24. Alpine Winter is on Reddit and Deskthority. Need a board to put these caps on? 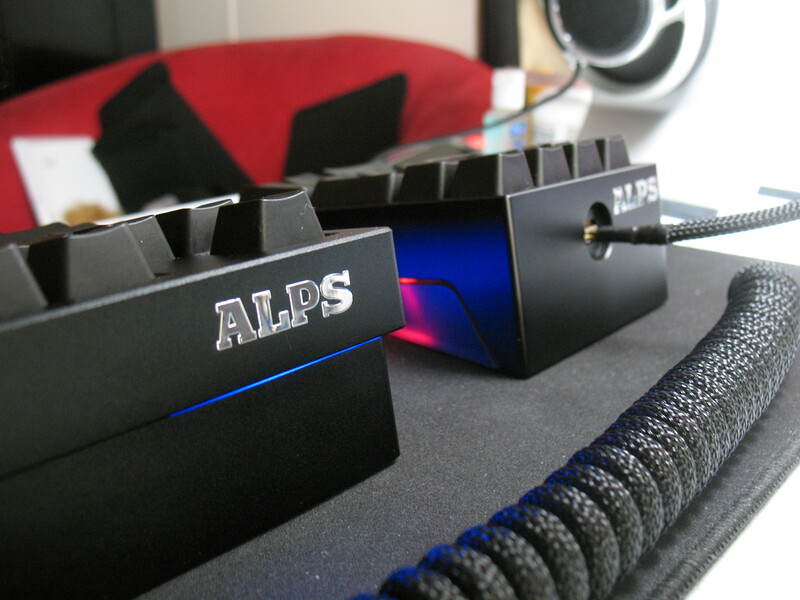 Check out Alps Party 60%! Special thanks to Badwrench for proving that Alps GB's can work; E3E for helping design the colorway; geniekid for suggesting the name; nubbinator for the artisan raffle & legend permissions; hashbaz, iMav and i3oilermaker for legend permissions; nickheller and jacobulous for feedback & suggestions on IRC; and everyone else who expressed interest in this set and offered support and suggestions. Looks great! Thanks for setting this up! Gonna put at least 1 order in! That spacebar pack is a fantastic idea! Looking forward to getting these on a board. I'll have to step up my board dismantling with this and the Alps Party hitting sometime late this year early next! Oh yeaaa buddy, Alpsie goodness. Thanks njbair and to all the contributors that made this happen! I can ALMOST finish my alps ergodox and be rid of these odd profile 1u keys on all the modifiers! 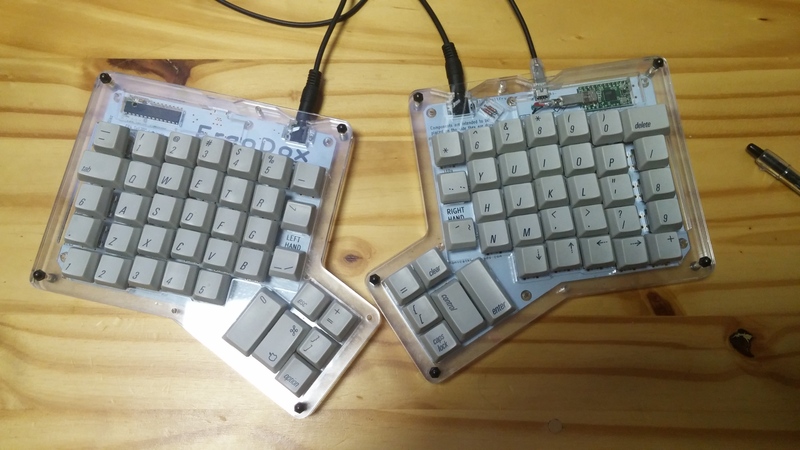 For those of you interested, I have AEKII caps on my ergodox so I compared the DCS profile and it's totally acceptable for my purposes and I think this color blue(?) will look great as modifiers with the beige AEKII caps. 12 1.5u keys but I'm not certain what rows to buy, anybody figure that out? 8 1u keys for the thumb cluster as it's currently a hack job too. Sorry if this is a silly question, are we required to purchase the parent deal to get the add-ons? I just want the novelty pack. Yes, the main pack is required. It says that on the order form, but I didn't see it in the OP. FYI, most community-run GBs used to do this in the past. 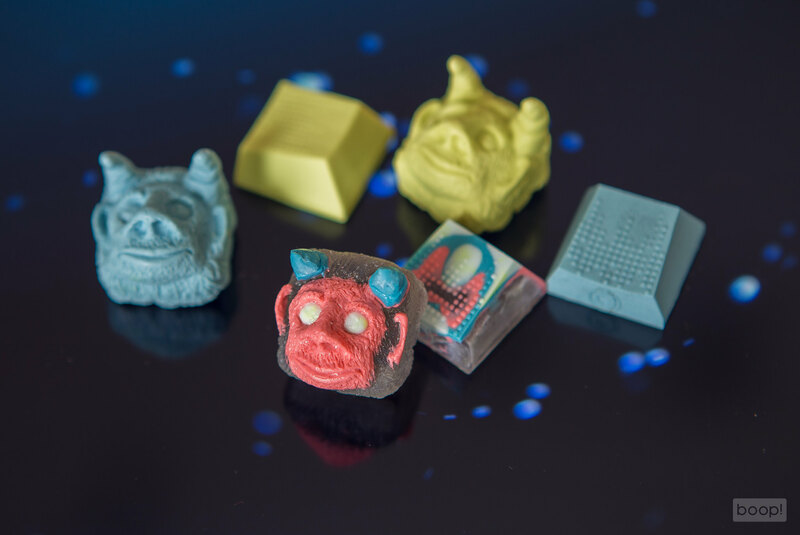 If you were a collector of those novelties, you had to buy in to the GB (and help us meet MOQ) in order to collect your caps. In for 2 base packs and a GH pack. Joined at the 75 MOQ. Hopefully it will tip at that price. 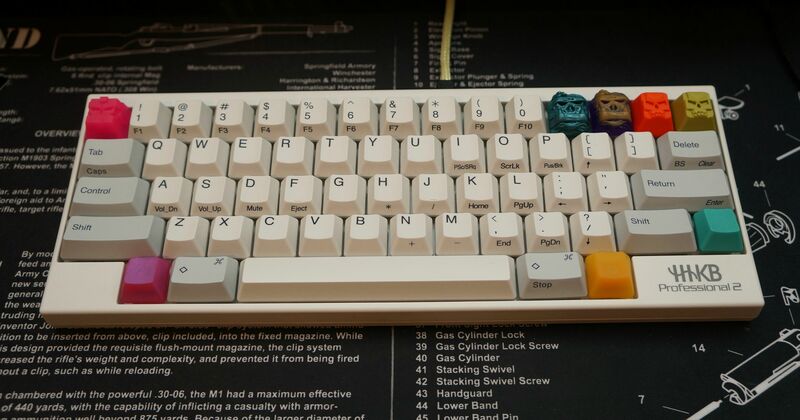 Looking forward to giving my KBP V60 some keycap love. It's Signature Plastics DCS, so not very thick. @bcredbottle, please keep in mind that Alps GB's seldom happen, so please jump in head first and let's hit 100+ MOQ! 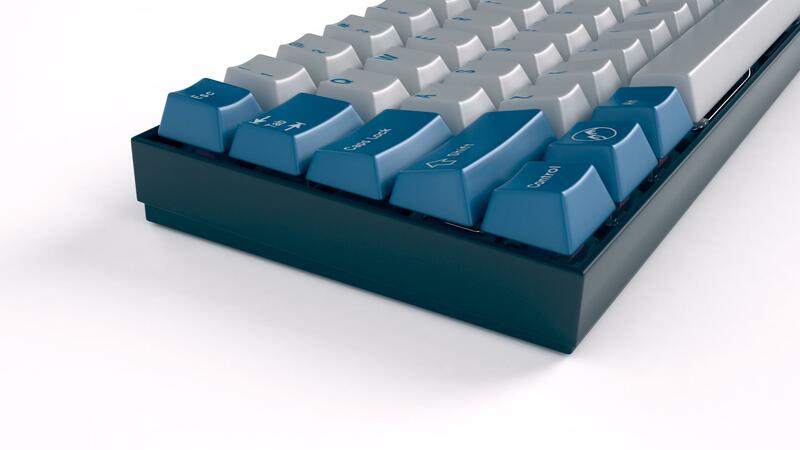 7-bit keeps threatening an SA-like Alps keycap buy. So watch for that in the 2020s! I like SA, but I don't really think I would prefer them over DCS for Alps. I have no problem at all continuing to support double shot DCS-profile group buys. I really like DCS! DCS may not be as nice as Cherry/GMK, but it's close enough for me. With the added benefit that, you know, we can actually have a successful GB for them. Had to jump in. Hope this is a successful buy. Nice set design, congratulations, I just do not have an ALPS board now, otherwise I'd jump on the buy immediately. This is going to sound weird, but I'm in for a set, at least one 6u spacebar set, maybe a 6.5u spacebar set, and two sets worth of blanks (hopefully they tip). Well I'm in for a set. Already regretting not adding blanks. [Control] is just left side of [A]. It comes from Sun Type3 key layout. It is so tempting; but, I just fell in love with my recent modded GON with my own version of Ergo Clears and vintage Cherry caps, that I'd feel unfaithful with, if I'd go for an ALPS now. I am sure you have been in my shoes. Hehe, I do not want to take over this fine thread though, it would be somewhere else, when I get the black 7u GMK space bar that it still needs to get it properly dress, by now Ivan's purple mods, and my vintage Cherry set do a decent job. Some electric blue mods are coming that would be its weekend's outfit. Being a SP set I assume the big keys will use Cherry-mount stems for stabilizers, am I right? Yes. The stab mounts will be cruciform. There are a couple of workarounds for this issue. I plan on outlining those soon. But if you are taking part in Alps Party 60%, those plates will work with stock stab wires. I'm actually going to update the verbiage, and make the blanks and novelties available by themselves. I don't think this will cannibalize base kit sales. The spacebar packs, however, are strictly add-ons. For blanks, is Row 1 or 4 the bottom row? Row 1 is the top row (and the function row on full-size boards), row 4 is the bottom two rows. Thanks for making this happen, njbair, and for the shoutout! Definitely in for one of everything, some 1.5u Row 4 blanks, two novelty sets, and a second base set if we get to 75 MQO! So hype for this! In for two infinity hacker sets. I'm in for a set with a novelty pack. Submitted for the kitchen sink. Obviously not in it for the Dolly and Fn. ...and we've hit our first MOQ, for the Geekhack novelty packs! Seems there is a problem with permissions on the spreadsheet. Also, if people want to add more do they just submit another order which will overwrite their previous one? I really want this set, but I've put an unofficial freeze on keyboard purchases for the time being. Will try to free up some funds by the deadline and join - I'd hate to miss out on this one. Great job with the GB, njbair. Holy cannoli you did it! I'm just about to dive right in, but I have a dumb question because I'm a weenie and don't understand haha. When you say we can apply for different MOQ's does that mean we are commiting to that price range and should that price range not happen we wouldn't get the kit? And lets say we put "1" in all three MOQ's, do you add all three of those up as three separate kits, or would we get the lowest one? I read on the form we get the lowest price, but I was just unsure haha. Thanks again for doing this GB! You are an Alps angel njbair! Yes, if you sign up for 1 set for the $75 MOQ and it isn't reached, you would not get the kit. If you sign up for 1 at $50, 1 at $75, and 1 at $100, you are signing up for 3 kits. If the $50 MOQ is met you will get all three kits at $50. If the $75 MOQ is met you will get two kits at $75. If only the $100 MOQ is met, then you would get one kit at $100. This is almost right, except you got confused and mixed up the order quantities (50, 75, 100) with the prices for each ($94, $79, $70). To put it another way, all three MOQs should add up to the total number of sets you want to buy at the cheapest price.